The boys perform worldwide, delivering seamless harmonies, sensitive arrangements and engaging stagecraft. Alan, for decades a vital member of Scotland's legendary Battlefield Band was inducted in the Scots Traditional Hall of Fame in 2016. 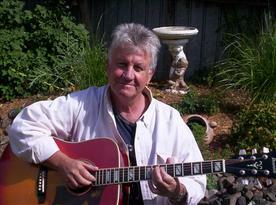 Rob is an accomplished and respected singer/guitarist. Together they present the finest of Scots music. Twin sisters, Alanna and Alicia charm audiences with their original folky/jazz/roots songs, sweet harmonies, fine songwriting and onstage warmth and fun. They will be joined by Sarah Bussutil and Silas Palmer. 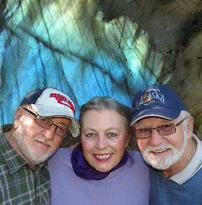 Az-I-Am has been performing at festivals and folk clubs for 11 years. Lilting tunes and haunting melodies best describe this well crafted trio. They perform a delightful repertoire of originals and iconic classics. 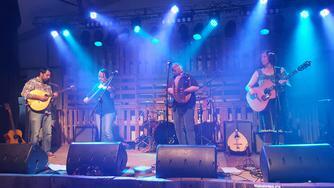 They play at the cross roads of Celtic, folk and country. 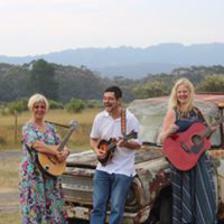 Chord-eaux is an Illawarra-based folk band committed to promoting and providing folk music and dance opportunities for people of all ages in the community. 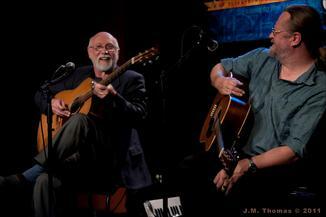 Their repertoire comprises folk songs and tunes from Australia, Ireland, UK and other places in the world. 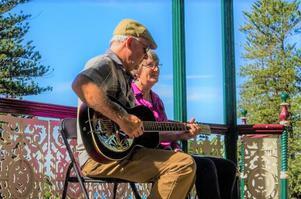 Danny Priestley (Australia) and Kate Charlton-Jones (New Zealand) are a duo who made their first performance at the Illawarra folk club, however, they now reside in Hawkes Bay NZ on a property wrought with music. 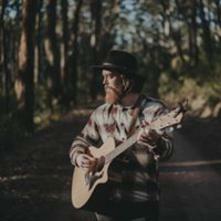 Danny is better known as the former singer in Illawarra based Celtic Band, Riogh, Kate is a member of NZ band, Cabin Fevre. Separately each have quite a different history, musically speaking. From Irish ballads to bluegrass, Danny and Kate set aside their musical differences and settle on a set focused on friends and whanau (family) from across the ditch with songs they love to play together. Dear Violet is a female trio from Wollongong NSW. Their smouldering harmonies blended with guitar and percussion are a treat for the senses. Along with a range of covers, the girls also sing some beautiful originals telling stories of our local history. 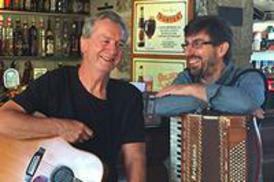 They have a large following throughout the Illawarra and beyond and play regularly at festivals, restaurants, weddings and other special events. Hey - and when you hear them you won't believe that they are only 15 and still at school. Nhunggabarra, Kooma, Muruwari man and international touring singer-songwriter Glenn Skuthorpe has carved a reputation as a masterful lyricist and compelling performer who gives voice to those whose stories must be heard. Glenn returns from touring Canada with his sixth album to join the Folk by the Sea line up. 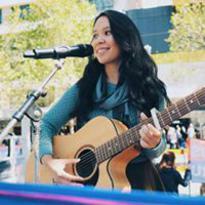 Jessica blends together melody and stories of Australia's past and present with songs that make you think and feel. Themes that also reflect on our relationship with others, the environment and past events that hold a special significance in the Australian story are among her original songs. Peace, Love, Music, Art, Song, Surf, Faith, Earth. We are Jocean. A dynamic duo of vocals / guitar and percussion. We perform original folk, roots and blues, works with a focus on social and environmental issues facing current and future generations. See our new EP "For the Fellowship of Life". 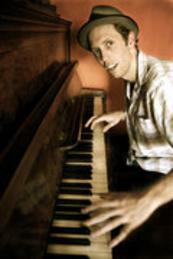 John Tubridy is a singer/songwriter from Wollongong, NSW, Australia. 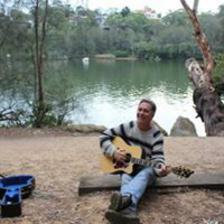 Accompanied by Guitar or Ukulele John sings songs which are about life, love and the joys of living. "Every day's a bonus" is John's philosophy of life. 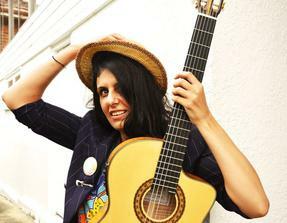 Kavisha Mazzella Female Troubadour. "A power and presence that's beyond words" Colum Sands. ARIA award and a former Port Fairy Artist of the Year winner. 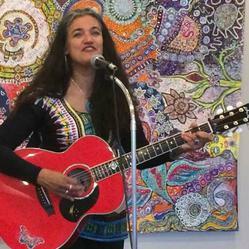 Songbird Kavisha Mazzella original song's lyrical ingredients include humour, poetry, social justice and the spiritual. Combine this prowess with the voice of an angel and you have the experience of a Kavisha concert. 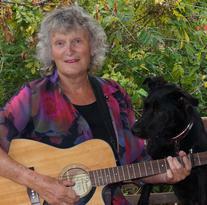 Singing in English and Italian she will take you on an uplifting boundary riding journey of well-crafted stories and songs ringing with echoes of Celtic. 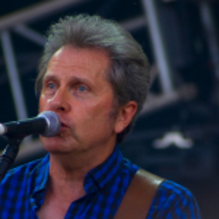 Ken Nicol a highly acclaimed musician, singer, songwriter, producer, playwright and composer, and as well as his extensive solo work he's been a member of Steeleye Span and The Albion Band. His music ranges from folk to ragtime, blues to rock, ballads to jazz, amazingly intricate instrumentals to singalong comedy numbers. The sounds of the pipes and the beat of the drums can always draw a crowd in Kiama. 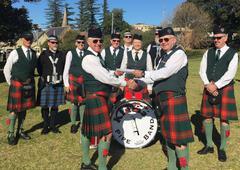 The kilt worn by members of the Kiama Pipe Band is called the ‘Red Ulster’ tartan. The uniform was chosen to maintain the link between Kiama and the many early pioneers of the district who came from that part of Ireland. The band is very cosmopolitan, having both male and female players from Australia, Ireland and America in its ranks. Under the direction of Pipe Major Paul Wells the band is always willing to offer its support for local community events where the presence of the band can add some colour and spectacle. 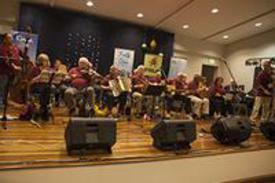 A key goal of the band is to develop its playing strength so that the Kiama community can continue to enjoy the benefits of having its own Pipe Band. 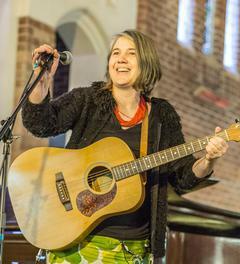 Linda Mizzi is a Blue Mountains singer-songwriter who, over a relatively short time, has come to the attention of festival audiences local and interstate. Her debut album,Real People, will doubtless expand her audience with its honesty, charm and simple gifts. Seamlessly blending folk, jazz and blues, she draws on influences as diverse as Rickie Lee Jones, Patty Griffin, Lucinda Williams and Doris Day! 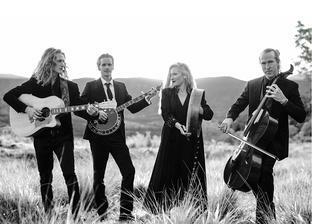 Linda is joined by band members; Alexander Keller on bass guitar and cello; Stefano Cosentino on lead guitar, Ian Neil Morrison on drums and percussion and Sonja Keller on violin. 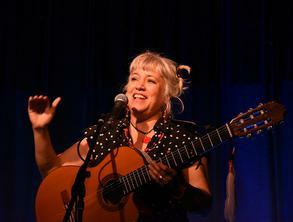 Described by Australian folk legend Judy Small as 'a young Malvina Reynolds', Little Foot is a folk singer/songwriter known for tackling political issues such as refugee rights, the environment, and social justice issues in the Philippines, her home country. A blend of music, storytelling, and a dash of humour. Laureate singer-songwriter Luke O'Shea spent decades travelling Australia and the world absorbing stories and universal truths that he now weaves throughout his celebrated songs. Heartbreaking & humorous, Luke O'Shea is a fitting heir to the storytellers & bush troubadours of past. Queanbeyan based Celtic trad/pipeband/bluegrass fusion five piece Mad Kelpie Playdate formed in 2017 through a mutual love of bagpipe music and crazy dogs. Their high energy performances combine smallpipes, uilleann pipes, flute, guitar and percussion to provide a modern take on traditional Celtic music. A bluesman at heart, avid wanderer reflecting troubadour tradition, albeit delicately picked ballads to foot stomping slide guitar driven down home swagger. 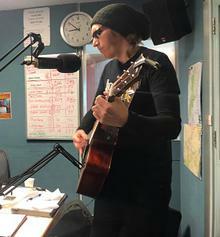 Melbourne based singer-songwriter & guitarist Matt Katsis features a one-man-band approach through use of percussive elements of the acoustic guitar stompbox and creating loop layers, this has seen Matt take to audiences far and wide with the ease and merit that parallels his music. 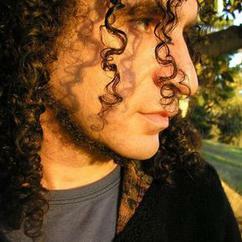 Of Azzopardi it's been said his ability to coax multiple melody lines out of the one instrument is simply breathtaking. His mastery of pathos atmosphere and intensity is awe-inspiring. Both his voice and his guitar are expert at expressing the subtlest sentiment and the most strident outburst. Described as a 'Central West Mary Black', Nerida has been capturing stories for over 20 years in finely crafted lyrics and emotive melodies. 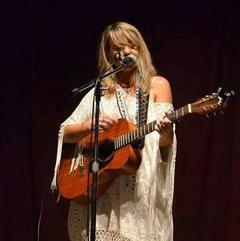 A true folky, she sings from the heart with a social conscience, sense of humour and love of country, always with a few sing-along songs. No Such Thing is a group of musicians who play collected Australian dance tunes. The unusual name came about after a Scottish musician commented that "there is no such thing as Australian dance music". The band recreates the authentic feel of the old time dance bands and will soon get your feet tapping. Pete is touring his freshly pressed album Calm, an indie-folk-piano-pop roller-coaster ride that lurches from heartfelt comedy to deep melancholy. It's a survival manual for contemporary small-town country Australia; caravan renovations, insomnia-inducing anxiety, romantic beginnings on South Coast beaches, losing your lover to the Mars 1 colonisation project... you will love this collection of vibrant vignettes. Robyn Sykes sculpts words using metaphors, metre, similes, rhyme and more. The award-winning poet, writer and entertainer has incubated crocodile eggs, lived in Japan, edited a newspaper, focussed an electron microscope, worked on a farm and with her husband raised four sons. Don't miss this unique poetry experience. Long-time musical acquaintances finally come together on stage to present an eclectic selection of contemporary folk-influenced songs that will appeal to a wide audience. Seanchas (Pronounced Shen-a-huss). These time travellers in sound help to unlock the secrets shrouded in the words, music, symbols and stories of the past - from beautiful ballads & songs of the joy of lovers re-united to choruses delighting in the seasons,exciting fiddle tunes to evocative airs. Seanchas bring you the music that inspires and fires them. Having performed at last year's Kiama Folk Festival as well as Kiama Carols, Australia Day Celebrations, the Kiama Jazz and Blues Festival and Anzac services, Sing Australia Kiama is a local community singing group who share their joy of being together and singing with their audience. They sing a vast array of songs from all genres. 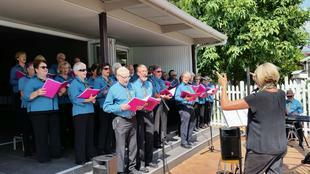 Sing Australia Kiama is a group of 50 members and is one of a network of over 130 singing groups around Australia. Coming from a Macedonian working-class family, where stories about hardship, romance, black magic and work ethic have been passed down through generations, Snez subtly weaves these influences into her own songs, featuring SNEZ on acoustic guitar, bouzouki and vocals. 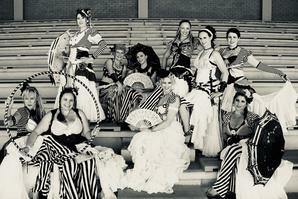 Drawing influences from Vaudeville, Bellydance, Tribal, Celtic and World Fusion, Illawarra dance troupe the Steampunk Vagabonds have gained a reputation for their vintage styling, elaborate costuming, and entertaining sets. Join them for a grand, steam and sail powered adventure around the world and across the seven seas. Stringline is a unique folk band playing catchy, powerful originals, traditional folk songs and tunes in their own infectious style. 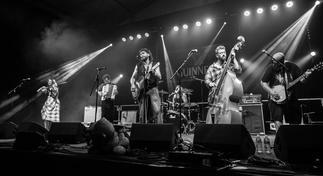 Stringline delivers an up-tempo lively sound, blending genres of folk, blues and bluegrass with their Irish roots, using acoustic guitars, mandolins, fiddle, banjo, and a focus on naturally blended vocals. Stories from Australian history to heartfelt personal experiences will have you listening intently. Original lead singer and guitarist from 70's group Fielding and Dyer. Fielding and Dyer wrote and recorded the Australian folk classic, The Whale. 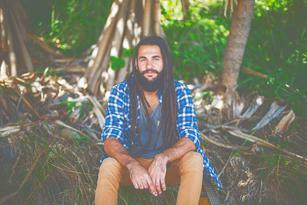 Winners of Bandstand songwriters award and winners of Australia's new faces grand final. From folk clubs of Scotland, to punk warehouses of Indonesia, and the Australian festival circuit (Falls, Spiegeltent, Port Fairy, National Folk Festival). 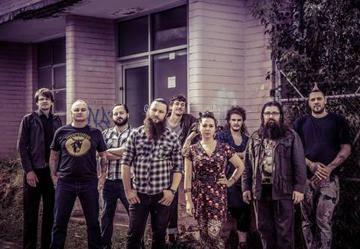 The Dead Maggies (Hobart) have been spreading tales of Van Dieman's Land's dark and oppressive history, in the form of lively folk-punk music. Independent Australian acoustic folk group consisting of stunning vocals, soaring cello, sparkling mandolin, boot banging banjo and intricate acoustic guitar. 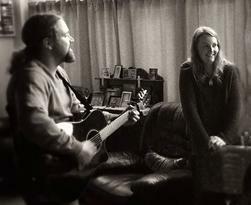 Mark with finger picking on guitar, and Trish with soulful vocals, the Honey Sippers from Camden, love to play music that engages and tells a story.Their extensive playlist includes unique acoustic versions of early blues artists, the best Australian music, modern classics and their own moving originals. Together they bring a life experience that lends depth and authenticity to their music. The Lurkers play acoustic hillbilly punk about super-profits, civil disobedience and the post-post-feminist revolution. They were the winners of the 2013 Songs for Social Justice' Award, presented by the Alistair Hulett Memorial Fund for their song 'Mining Man', a protest song about Coal Seam Gas mining. 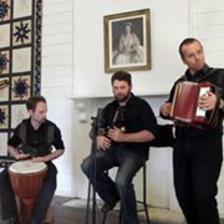 The Mutual Acquaintances, comprised of Ian Barker, Brett Guyer, and Michael Spencer, is a three-piece ensemble performing new and traditional Anglo-Irish music with vocals, guitars, cittern, accordion, tin whistles, bodhran and uilleann pipes. Together, they present a rich program of traditional and contemporary folk music ranging from a cappella songs to atmospheric guitar solos and lively sets of jigs and reels. The Royal High Jinx, write, play & sing danceable music inspired by European traditions, shaded with gypsy jazz, Latin & swing grooves, a pinch of folk and finished with classical virtuosity. 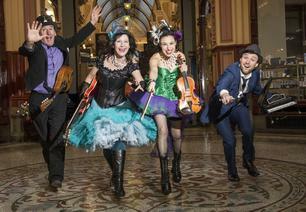 Sing, dance and be entertained by Melbourne's most colourful dance band! 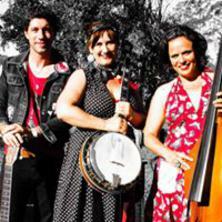 The Water Runners mix of great harmonies, witty stage banter and quality musicianship has delivered entertaining performances of bluegrass-infused Australian music at festivals, pubs, clubs and events from Sydney to the Snowy. 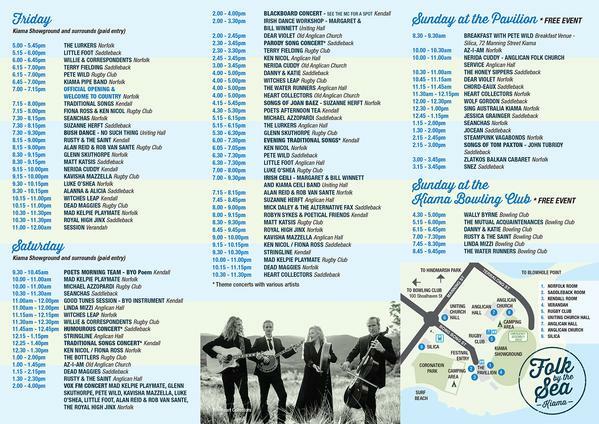 Guitar, banjo, mandolin, fiddle, double bass and percussion combine in memorable songs of love, life and local legends. 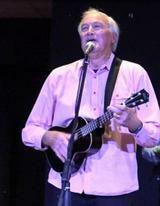 Wally Byrne's songs, set in Australia's past and present, tell stories about what it means to live. After a couple of decades of writing and performing, he released his solo album in 2016. Wally is a classic folk story teller. His songs are a tonic for the soul. Willie and the Foreign Correspondents will provide an upbeat session of laughter, sorrow and joy with "intelligent, original ballads delivering compelling commentaries on life, love, death and politics" - Canberra Times. 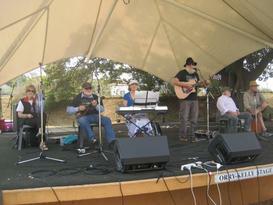 WTC has two albums and has appeared at the National Folk Festival and at Tathra's Band Together Concert. With the richness of uilleann pipes, Irish flute and vocal harmonies backed by prog-folk bouzouki and stompbox, Witches Leap filter trad music through the hanging swamps and mythology of their Blue Mountains home. Original instrumental tunes are cut with convict-gospel singalongs and folk-punk tales of black bushrangers and errant redcoats. 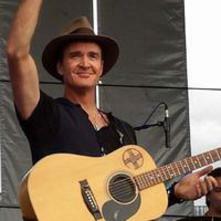 Since the release of "Broken Road" in December 2017, Wolf has been the subject of a significant amount of buzz with national radio play and over 350-thousand digital streams. 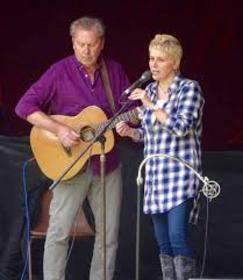 Despite the recent attention Wolf's on-stage demeanour remains honest and earnest consisting of local tales. Zlatko and friends, with their special love for gypsy music from the Balkans and Eastern Europe, share the spirited and captivating tunes of gypsy life, from moving love songs to passionate dance music, with the soul-stirring fire of true gypsy blood.